Hair Xpertise offer a wide range of affordable hair care products especially their highly popular Argan oil. I was surprised when searching online that they now have a salon formula range specifically for blond hair. Any blond will tell you that keeping blond hair looking great, whilst stopping the brassiness, is a constant hair mission us blonds have to endure. A purple shampoo is a blonds best friend in keeping your tone of blond looking perfect and is the secret weapon you need in your hair care routine. Lots of brands now have that purple friend or marketed silver in their range but some can leave your hair too pigmented or leave your hair feeling dry. Us blonds are looking for that balance between perfect tone and perfect moisture, so we can feel confident with our blond colour but know are hair is being cared for and healthy. Hair Xpertise offer in their range the Argan Blonde Silverising Shampoo, Conditioner and a Toning Spray that all feature protecting Argan Oil and UV filters. The salon formula silverising shampoo is specially formulated with Argan Oil and Pro-Brightening Complex™ to neutralise and remove brassy, yellow tones in blond, highlighted and grey hair. 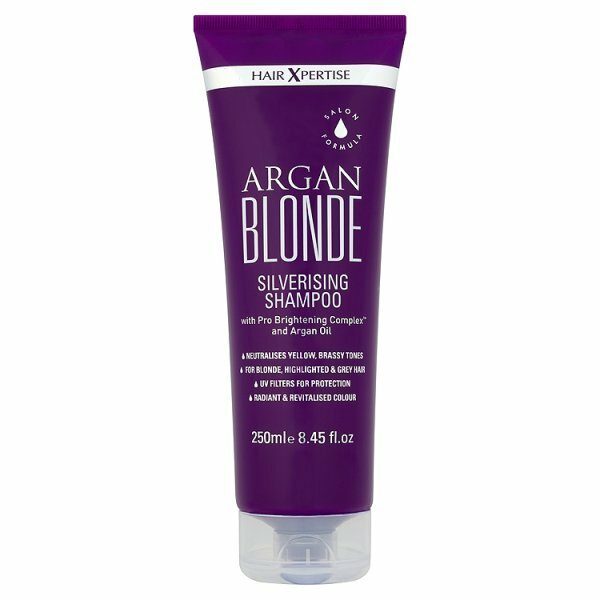 The 250ml silverising shampoo will leave your blond hair bright and refreshed, so you can fall in love with your blond again. Enriched with Argan Oil, the salon formula will leave hair feeling soft and silky with radiant and revitalised colour whilst the special UV filters will help to protect and prolong your colour. You will notice when you dispense a small amount into your hands to apply to your wet hair, just how pigmented the shampoo is. Working through all your hair you will notice how your hair is transformed to a smooth texture which was a plus point for a silverising shampoo. You can rinse immediately or you can leave on your hair for 3-5 minutes for an enhanced colour, the shampoo is really moisturising so don't be scared to leave it on your hair for the maximum time. The shampoo rinses out really well with a light scent, leaving your hair ready for the next stage. The salon formula protective and silverising conditioner enriched with Argan Oil and UV filters to help protect colour and leave hair soft and shiny. 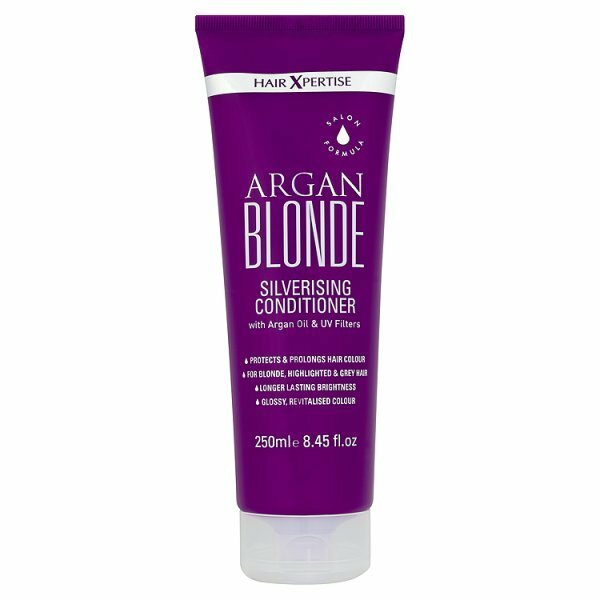 The protective conditioner is specially formulated with Argan Oil and UV filters to help protect and maintain blond, highlighted and grey hair colour for longer lasting brightness and tone. The 250ml conditioner is a light purple colour compared to the shampoo. Distribute the conditioner through mid lengths to ends and you can leave it on your hair for 3-5 minutes. Leaving it on your hair for the longest time is a better option for the conditioner to really lavish your hair. My hair felt so soft through the rinsing stage and when towel drying felt moisturised without feeling heavy. 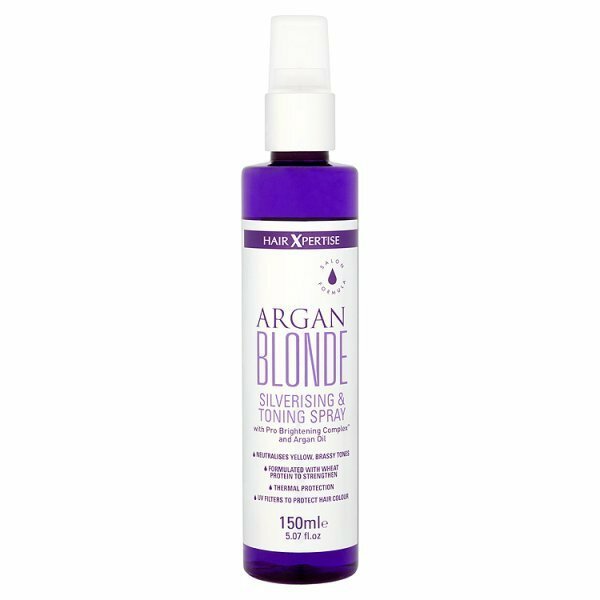 Argan Blonde Silverising & Toning Spray. The Argan Blonde Silverising and Toning spray helps neutralise and protect against yellow, brassy tones in blond, highlighted and grey hair. Formulated with Argan Oil and Wheat Protein to help strengthen and nourish the hair, whilst UV filters protect against sun damage to ensure colour stays revitalised. Added Thermal Protection and styling agents, this silverising spray will leave the hair looking healthy, stronger and radiant with colour. Shaking the 150ml spray bottle before use, spray evenly throughout damp hair and comb through so every strand is saturated. The spray head delivers a lovely amount of the product, so you only need a few sprays of this for your hair to be covered by either sectioning your hair before you spray or tipping your head forward and then back for application. This does have wheat protein in so u must be wary if you use any other products that are protein based. Using too much protein can make hair dry and brittle and eventually break off, so you must have a balance between moisture and protein. Using each product from the Hair Xpertise Argan Blonde Silverising range was a pleasure to use and try. My hair felt lavished and cared for whilst my blond looked much brighter and generally more healthy. I saw no purple tinge or pigment left in my hair after styling and my hair did not feel dry in condition, great for a silverising range! Want to know more? Head on over to Hair Xpertise to discover their full range and bring a new lease of life to your colour and tresses! X Neil.